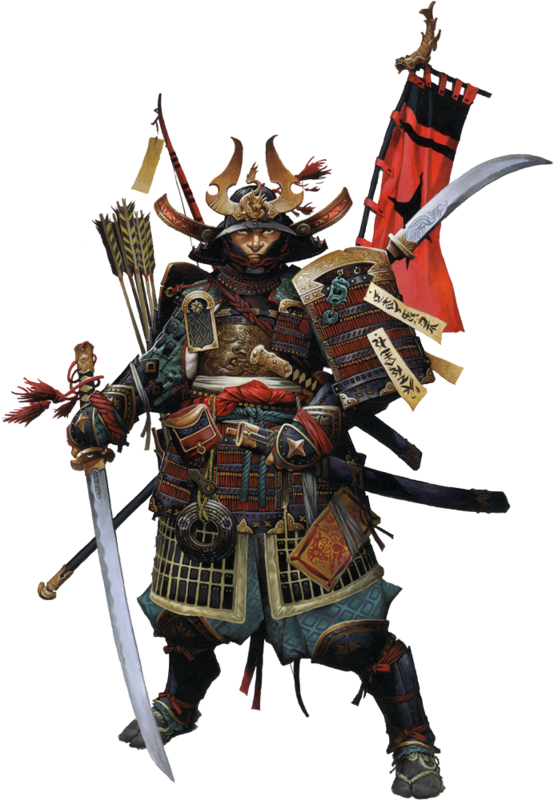 Would you like to learn more about Hayato, the Iconic Samurai? Read her Meet the Iconics entry over at the Paizo blog, or any of the other blog posts that mention her! Hayato was born a retainer on the estate of Lord Nakayama Hitoshi, just a few days' ride from the great city of Oda in Minkai. The son of the chief falconer and his wife, Hayato—whose name means "falcon"—quickly proved just as proficient with the dangerous birds as his father, emulating their proud and fierce natures. It was while accompanying his father on one of Lord Nakayama's hawking outings that he first came to the lord's attention. At eight years old, Hayato was assigned the honor of being the personal attendant to the lord's son, Masao, assisting the privileged child with his falcon. All went well until the noble son, still new to the sport, mishandled his bird and nearly lost an eye for his trouble. The furious lordling prepared to kill the falcon then and there, but Hayato interceded, explaining the boy's error. Enraged even further, Masao began beating Hayato, drawing the attention of the rest of the hunting party. Though Hayato bowed low and accepted the savage blows of his master, he neither cried out nor begged for mercy. When Masao finally tired, Lord Nakayama himself addressed the bloody servant child, asking him why he had been so bold as to correct his superior. Without faltering, Hayato bowed to the lord and said simply, "Because it was the truth." Yet Masao's death was only the beginning of the Nakayama family's misfortune. It was shortly after this episode that the Nakayama estate was visited by Kaneka Yoshiro, a traveling lord and government official with a position high in the Imperial Court. With considerably more prestige and official sway than Nakayama, Kaneka was received with full honors—yet it quickly became apparent that the guest was interested in more than just hospitality. Within a few days, Kaneka's cunning insults, lewd advances toward Nakayama's wife, and barely concealed challenges to Nakayama himself left Hayato's lord with no choice. Honor forbade him from allowing the slights to stand unanswered, yet challenging a governmental superior was as good as a death sentence. In the end, honor won out, just as Kaneka knew it would. Nakayama challenged Kaneka to a duel, and was quickly slain by the talented swordsman. In recompense for the "insult" Kaneka had suffered, the Imperial Court allotted all the Nakayama holdings to Kaneka. Nakayama's widow, faced with the prospect of a dishonored existence among peasants, had no choice but to accept Kaneka's proposal of marriage if she wanted to retain her position. Though the Nakayama samurai were bound by direct order of the court to honor their new arrangement—and plied with substantial gifts by their new master—Hayato saw the theft for what it was. Several nights later, having watched Kaneka's celebrating guards drink themselves into unconsciousness, Hayato crept into his former master's bedchamber and confronted the usurper even as he lay sleeping with his new wife. Though Kaneka screamed for his retainers, in the end it became clear that his only option was to fight. Taking up the sword that Hayato tossed onto the bed, Kaneka did everything he could to kill the samurai quickly, yet Hayato would not be denied his revenge. At last, bleeding from several terrible wounds, Hayato succeeded in getting past the noble's guard, ending his short-lived dominion over the Nakayama estate in a fine spray of blood. Now in his mid-thirties, Hayato is a hard man who keeps to himself. Though he has long since learned to speak Taldane, he remains terse by nature, feeling that everyone in his new home speaks too much but says too little. He operates as a fearless and talented mercenary—or ronin, as he terms it—for those whose cause seem righteous, yet refuses to bow to anyone regardless of status, saying only that he has had his fill of masters. Hayato is loyal to those few friends who can get past his stone-faced demeanor, yet remains secretly tortured by his conflicting senses of honor. To continue living as a masterless samurai—let alone one who has committed a great crime—is shameful, yet to deny Lady Nakayama's command would be equally shameful. With no clear answer, Hayato has temporarily shelved the problem. Yet deep in his heart, he harbors a secret hope: that perhaps one day he might raise an army of champions and take it back over the Crown of the World, rooting out the corrupt politicians of his homeland and restoring the honor of himself, his adopted family, and the samurai code he was born to uphold.